Whether you’re on the hunt for easy homemade playdough recipes, or need some play-doh games, activities, sets, and mats to help engage with your child and encourage the development of his or her fine motor skills, this collection of ideas has it all – and more! 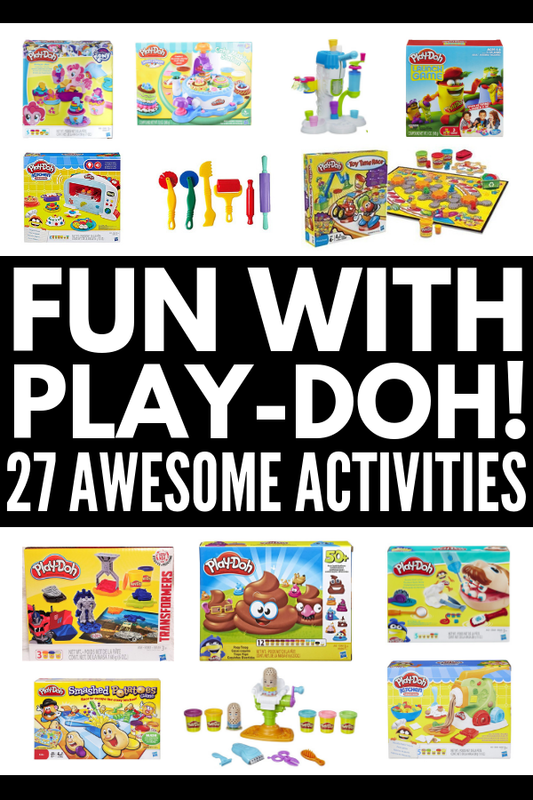 We’re sharing 27 creative ways we have enjoyed playing with play-doh in our house over the years, and hope our ideas and recommendations offer as much fun to you and your little ones as they have to us! It’s calming. The act of kneading, rolling, moulding, and cutting play-doh is not only fun, but it can also be extremely beneficial for kids who struggle with anxiety. Manipulating play-doh can be extremely calming, allowing children to open up and talk about things that may be bothering them. It helps strengthen fine motor skills. Kneading and moulding play-doh is a great way to develop the muscles in our hands that are needed for fine motor tasks like handwriting. It promotes creativity and imagination. And when kids play with play-doh with their peers, it can help develop their social and emotional skills and promote self-expression. It’s a great sensory activity. Play-doh is a great tactile and proprioceptive activity for kids, and can be highly beneficial to those who struggle with sensory processing disorder. It can help develop other skills. Since play-doh is such a calming and fun activity for kids, you can use it to help your child work on other skills, like language, literacy, math, and science. Check out the play-doh games, mats, and sets below for inspiration on how you can incorporate play-doh into your lesson plans and after school activities! The ‘in under 10 minutes’ part of this recipe grabbed me. LOL. I love the consistency of the dough this recipe makes, and I’m pleasantly surprised with how long it lasts when stored in a plastic bag. All you need is flour, salt, vegetable oil, food coloring, water, and cream of tartar. This last ingredient threw me as I’d never made homemade playdough prior to trying this recipe, but it seems to be the secret sauce to homemade playdough as many other recipes use it. Who knew? If your little one has a gluten sensitivity like my daughter, this is a great easy playdough recipe to consider. It’s pretty similar to the recipe above and ite works just as well, but it uses gluten-free flour for allergy safety. If you’re the parent of an anxious child, adding a bit of lavender essential oil to your favorite homemade playdough recipe can be extra calming, and I love the idea of adding fresh lavender for added texture. Making edible playdough can be a fun activity to do with your kids, but be sure to use caution and remind your child that not ALL playdough recipes can be ingested! There are all kinds of edible playdough ideas on Pinterest, and if you and your kids love all things chocolate like me, this one is sure to be a hit! Since we’re a gluten-free house, I couldn’t include the recipe above without an allergy-friendly alternative. This recipe is made with Gluten-Free Bisquick and smells AMAZING. I feel like I could spend all day sharing brilliant homemade playdough recipes, and since this one uses only TWO ingredients – hair conditioner and corn starch – I simply had to share. 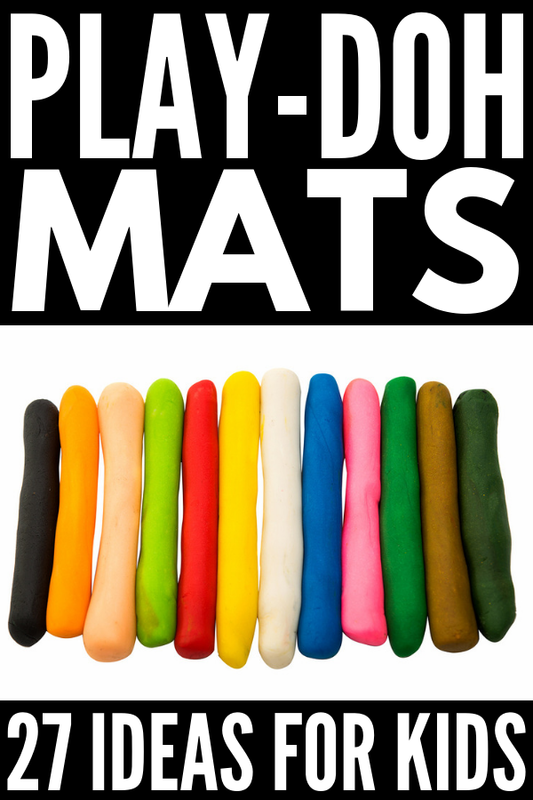 Quick Tip: Put your printable play-doh mats in plastic sleeve protectors and store them in a 3-ring binder so you can use them over and over again. Alternatively, you can laminate them. We own a Fellowes M5-95 Laminator and I have nothing but good things to say about it. As you can see, there are so many fun play-doh games, activities, and learning mats you can enjoy with your kids as they grow, each providing so many benefits. Playing with play-doh is such a great calming activity and I love that it allows children to connect with others while simultaneously developing so many skills. There are heaps of amazing play-doh mats you can download for free, and tons of fabulous play-doh sets you can buy inexpensively on Amazon, but sometimes it’s best to keep things simple. Give your child a few tubs of play-doh and a container of play-doh tools and let their imaginations run wild! KEEP CALM, AND MOLD ON! If you liked the collection of play-doh games, activities, and mats, please share this post on Pinterest! And if you’re looking for more ways to have fun with your child, please follow our Kids board where we share all kinds of fun ideas we find each day!